When it comes to property sales and as the market slows down a little, it’s really important for sellers to attract buyers if they’re to get the best price, so the most in-demand features should be at the front and centre of your strategy. That makes new research by Go Compare home insurance experts very interesting indeed. Thanks to their extensive pool of customers, Go Compare have managed to pin down the 20 most sought-after features buyers look for in a new home. So now you don’t have to just trust what the estate agents are saying – you can see the facts behind it too. Practical features such as central heating, double glazing, home security and garden space topped the list, while a reliable broadband connection moved up into the top five for the first time – up from 8th place last year. This reflects the increasingly switched on, tech-savvy world we now live in, where fast internet speeds are deemed a necessity, rather than a luxury. Not only that, but a clear mobile signal and a good energy efficiency rating both launched themselves into the top 10 for the first time ever. By contrast, friendly neighbours (9th last year, but 12th this year) and access to a driveway or dedicated parking space (5th last year, 9th this year) both slipped down the rankings significantly. Without a doubt, the two most important factors for buyers were a good central heating system (82%) and double glazing (80%). In fact, these were the only two things to go above 75%, so they really can’t be compromised on. If your house hasn’t got double glazing installed, or has a crumbling, shaky heating system, you could be losing out on a huge amount of the market. Security has also become a significant factor for buyers, with 74% stating that secure doors and windows were a necessity – often valued over things like having a bath or a garden. Technology also plays a big role in buying decisions. Key points to take away from this are that buyers value a good, reliable broadband connection (that is strong enough to support streaming films and TV) (59%), plenty of electrical sockets (also 59%) and a reliable, clear mobile phone signal (58%). Slightly lower down the list (but still in the top 20) were the little luxuries, which all held a much higher importance than in previous years. 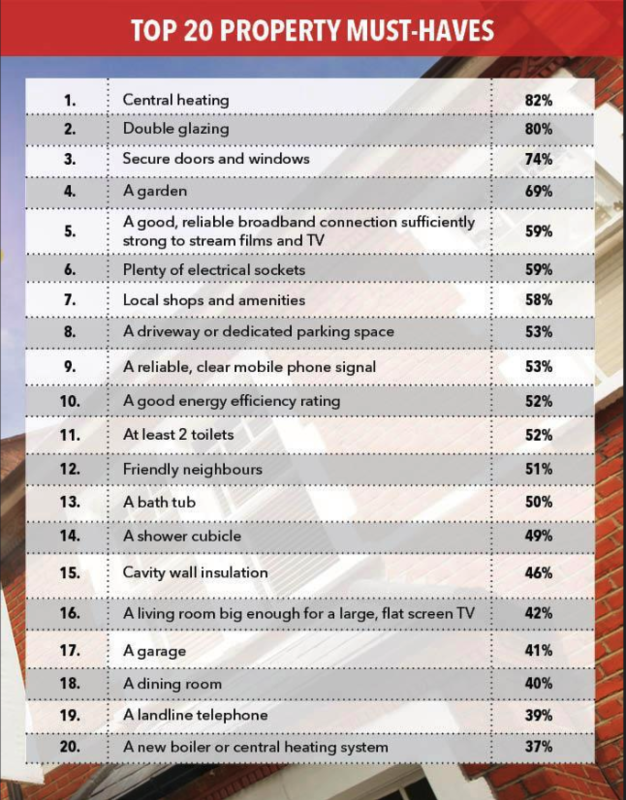 This included the presence of at least 2 toilets (52%), a bath tub (50%), a shower cubicle (49%), cavity wall insulation (46%), a living room big enough for a large flat screen TV (42%), a garage (41%), a separate dining room (40%) and a landline telephone (39%). While this list of priorities is always fluid, and moves with the demands of buyers in a particular area, it certainly sheds some light on what is considered important in a new home, and what is worth sacrificing for the right deal. For sellers, this means taking a good long look at your home and assessing where it falls short on each of these criteria. 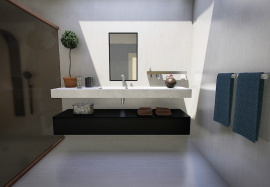 If you’re lacking in a few key areas, it might be worth investing in installing them to boost the value and desirability of your property. Sometimes this might be cost prohibitive but, depending on what you’re missing, it could add a lot of value for buyers. Fortunately, most of the top 10 (and even the top 20) desirable features are easily attainable, if you don’t have them already. For example, most homes now will have plenty of electrical sockets, local shops are a fixture in cities, towns and villages everywhere, and most areas can offer either driveway or off-street parking, all of which fall into the top 20. You should also be talking to your estate agent about how you’re displaying your property for sale, and what features you want to bring to the fore. Gone are the days when talking about parking availability was crucial – now it’s all about efficiency, security, heat retention and little luxuries. If you include details like broadband availability, electrical socket positioning and the location of local amenities in the listing, you are likely to generate much more interest in your listing than if you don’t. At Northwood, we work with sellers and landlords to ensure they present their properties in the best possible light to achieve quick sales or rentals. From our dedicated photography team, who ensure your property is showcased at its best, to our listings gurus, who know exactly what features to highlight in your listing, your property is in safe hands. If you would like any help or advice on selling your home, all you have to do is ask! Just get in touch with the team today.